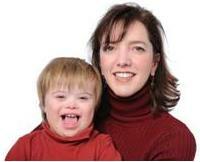 The best guide to learning about Down syndrome facts including symptoms, risks and causes. One of the biggest concerns during pregnancy is whether your child may have something wrong with him/her. If you do choose to have the prenatal testing that can be done with amniocentesis, chorionic villus sampling, and/or blood testing during pregnancy, always remember there is still a chance of obtaining a false positive. You may want to consider whether you have an increased risk, such as advanced maternal age, before making any final decisions. If it does turn out that you have a child with a chromosomal abnormality, I am hoping this website will give you the help and down syndrome facts you are looking for to guide you on your journey. Learn how a child is diagnosed during prenatal testing and after the child is born. There are some risks involved with testing during pregnancy, so it’s important to know the facts before you choose what you would like to have done. Tests will usually include using ultrasounds, blood samples, and amniocentesis if there appears to be a higher risk of the child having DS. There are three genetic causes of DS, including Trisomy 21, Mosaic and Translocation. The most common cause is Trisomy 21, which typically has the most severe symptoms and associated features. All three involve an extra copy of the chromosome 21, but Mosaic does not involve an extra copy in all of the body’s cells. Currently, facts show there are no known behavioral or environmental causes of Down syndrome. The most common attributes, include physical, cognitive and behavioral characteristics. Each child is unique and will have a different combination of these traits, but there are some general features that are typically seen in all children with this diagnosis. These may include being shorter than average, eyes that slant upward and language impairments. Symptoms and risks can vary for each individual. This also depends on the type of Down syndrome an individual is diagnosed as having. The most common risks include medical conditions that occur as a result of the diagnosis, such as a heart defect, seizure disorder, and/or hypothyroidism. Symptoms will often involve a mild to moderate cognitive disability that will require the need for special education and possibly child behavior support within the home and at school. Learn the statistics surrounding this disorder, including life expectancy and frequency. Down syndrome facts show that it is the most common cause of birth defects with one occurrence per every 800 to 1,000 births. Incidence has gradually increased by 31% for no known reason over the past 30 years. Also discover statistics that influence or increase the likeliness of having a child with this disorder. While most treatment options include treating medical conditions, there are some nutritional interventions that have shown to have favorable outcomes. A small group of individuals, including doctors claim that the features of DS are not always present at birth, but develop over time. Following a recommended protocol for vitamins and supplements are showing the possibility of preventing the typical symptoms and characteristics associated with DS. Click the link above to find out more.